Gabriella Kiss's jewelry, inspired by flora, fauna and nature's life cycles, is infused with personal meanings beyond just adornment. The pieces - many of them singular treasures - are thoughtfully rendered in 18k gold, fine silver, blackened bronze and distinctive gemstones. This poetic and alluring jewelry, with its nod toward the scientific world, captivates the wearer with transcendent narratives of beauty, sentiment and the human condition. 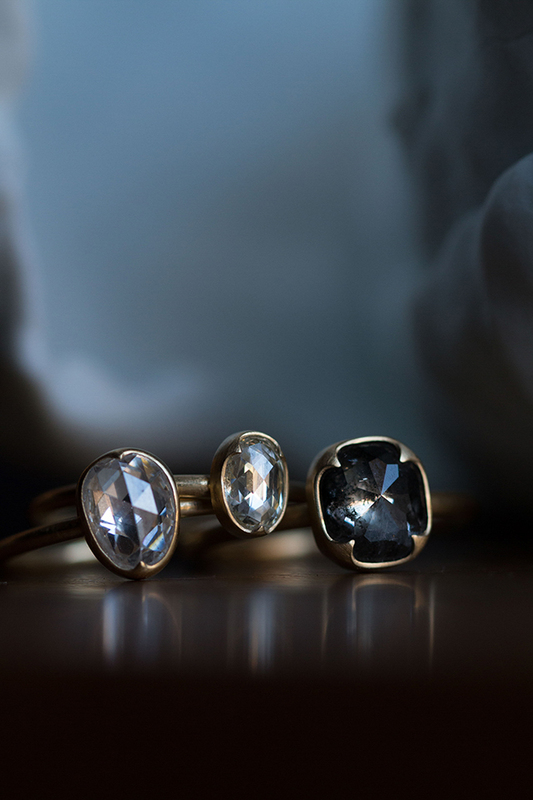 Gabriella Kiss 18k gold and diamond rings. White rosecut diamond ring, 1.11ct (in-store), white rosecut diamond ring, .55ct , black lacy diamond ring 1.71ct. Gabriella Kiss 18k gold and gemstone pendant necklaces. 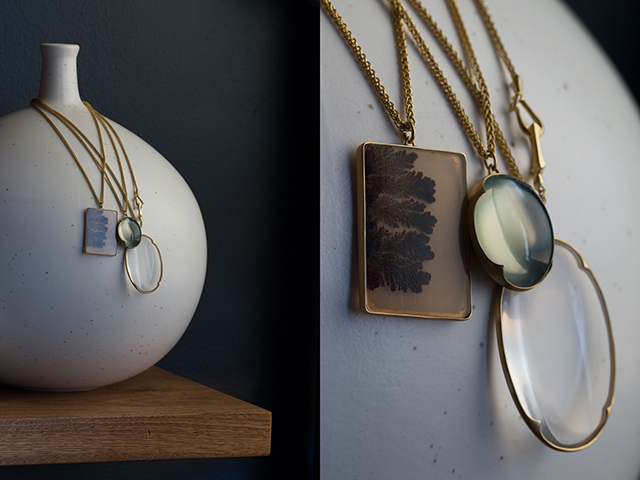 Dendritic agate necklace , ceylon moonstone lens necklace and crystal quartz lens necklace. 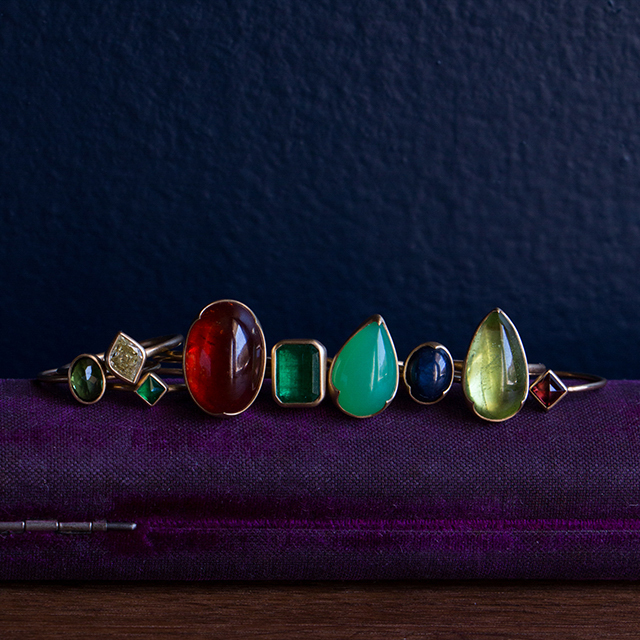 Assorted Gabriella Kiss 18k gold and gemstone rings. Green tourmaline oval, antique fancy yellow diamond marquis (in-store), diamond shaped emerald, large oval spessartite garnet, rectangular emerald, pear shaped chyrsophase, oval star sapphire (in-store), pear shaped peridot and diamond shaped garnet rings. 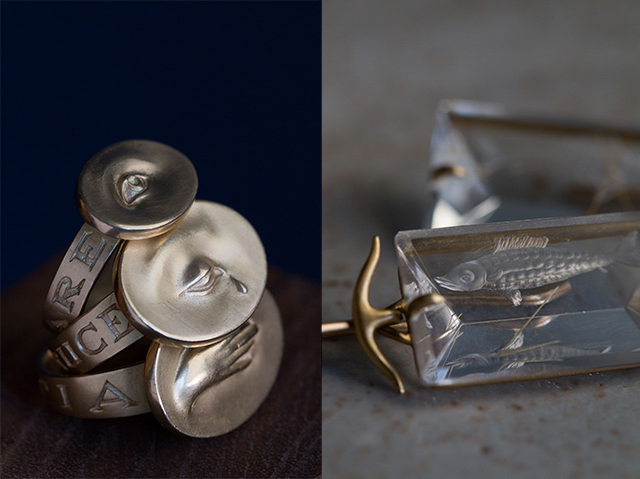 Gabriella Kiss 18k gold love token rings and one-of-a-kind etched quartz prism earrings. Small "Invigilare" eye ring, large "Nil Nisi Cruse" eye with tear ring, large hand "Amicitia" ring, Rutilated quartz etched fish prism earrings. 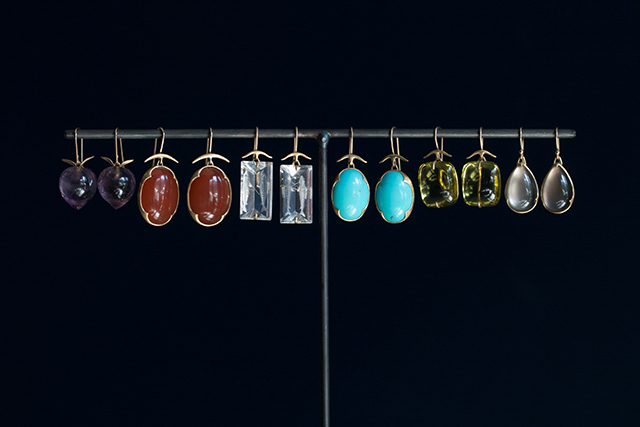 Gabriella Kiss 18k gold and assorted gemstone earrings. Amethyst peaches (in-store), carnelian oval, etched rutilated quartz, turquoise oval, lemon quartz pillow earrings, smokey topaz over mother of pearl teardrop earrings.